This weekend was spent preparing to bring two new bunnies home! My friend’s French Angora gave birth to 10 healthy babies two months ago, and now – eight weeks old – they’re ready to be weaned and brought home! A couple of weeks ago we began looking for hutches. We found a large hutch for sale on craigslist for $25. It had previously been used as a chicken coop and needed some work – stabilizing the legs, replacing the wood floorboards with 16g wire mesh, cleaning the heck out of it. But it is large – about four feet long by two feet deep by two feet high. It’s an outdoor cage. 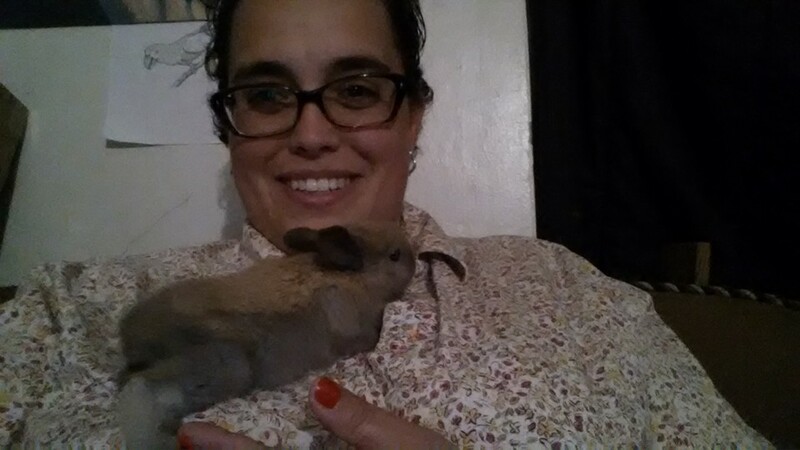 The bunnies will live outside year-round barring extreme temperatures. They’ll be well-suited for the cold weather, and during these hot summer months they stay cool with a 2L bottle filled with frozen water. 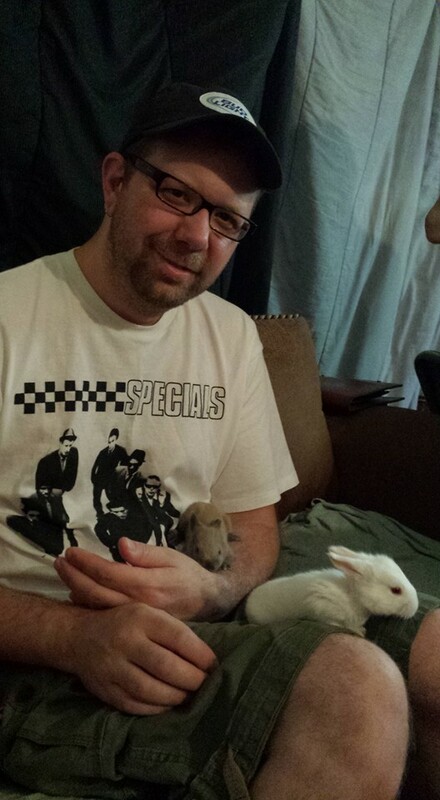 Me with Officer Hops, about one month old. I’ve been doing reading on diet, anatomy, behavior, brushing. The brushing is a big part of this whole deal because French Angoras are long-haired rabbits, and because we’re getting the bunnies in exchange for collecting the fur for my friend’s spinning wheel. And today was the big day! The final touches were put on the hutch, the bunnies took a short car ride in the cat carrier (done purposely to help introduce the cat to the smell of the bunnies), and then were introduced to their new homes. We left them alone for a couple of hours and then brought them inside for some socialization and brushing. The cat perked up when she saw the bunnies. The Hubby was on Operation Cat Watch aka Operation Don’t Let the Cat Attack the Bunnies; he was at the ready as Prada jumped up on the ottoman to sniff at Becky, but she lost interest after the initial sniff. For her part, Becky barely acknowledged the cat. Officer Hops was sitting across the room on my friend’s lap and also had no fucks to give about the fact that a known baby bunny murderer was sitting less than three feet from her. I read that when cats are introduced to rabbits in a non-hunting environment…say, when a rabbit is sitting in their front room on their owner’s lap….they are less likely to see them as prey/play. So I think we’re going to be aright when the rabbits are brought inside for lap time. Here’s a video from earlier of the two of them enjoying some clover. They’re like little furry paper shredders y’all. ← CONvergence is Upon Us!